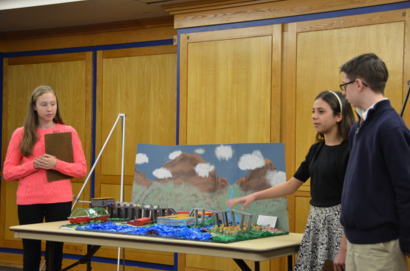 LAWRENCE — Two middle schools from Lawrence claimed the top two spots at the Great Plains Future City Competition, hosted Jan. 23 at the University of Kansas School of Engineering. More than 400 middle school students from across the Midwest gathered to present futuristic cities along with their innovative waste management systems. KU Engineering handed out more than $18,000 in scholarships and prize money to the top five schools, which includes a $1,000 scholarship for each of the winning team’s 18 members – a team known as Tallakha-Muhara, from Southwest Middle School in Lawrence. As the competition winner, Southwest Middle School is invited to Washington for the national competition Feb. 13-15. The school also receives a $250 award for claiming first place. A cash award of $250 also went to Liberty Memorial Central Middle School in Lawrence for their second-place finish. $125 prizes went to the other schools rounding out the top five: Pike Valley Junior High in Courtland, Morgan County R-1 School in Stover, Missouri, and Lansing Middle School in Lansing. The competition, sponsored KU Engineering, the Kansas Department of Transportation and the American Society of Civil Engineers, challenged teams to develop a new way to deal with the problem of waste management in a city they’ve created. Throughout the fall, teams designed their own city using SimCity software, wrote a 1,500-word description of their city, built a scale model, drafted a project plan and prepared a presentation for the judges at this year’s competition. KU is the premier engineering school in Kansas and is the only AAU research institution in Kansas.